Twitter does it again! Sports Illustrated and SI.com baseball writer Jon Heyman posted the news to his twitter account BEFORE any major media outlet. This proves once again that Twitter can be your source for the most up to date information on any given topic. 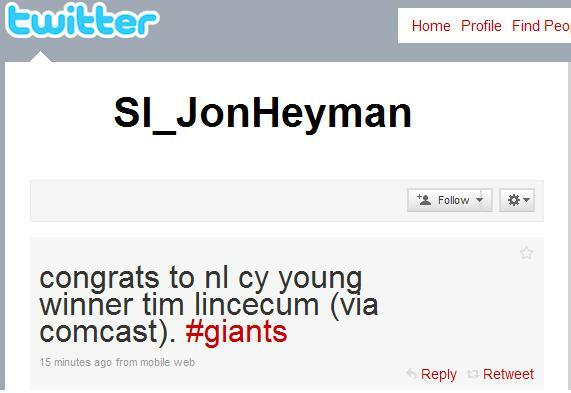 This is Lincecum’s second Cy Young in as many years even though he had a rather unimpressive wins total. 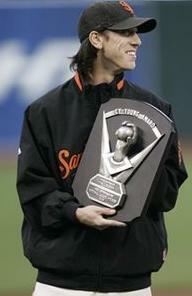 Although, Zach Greinke’s win total was unimpressive but he also took home the hardware. Runners up Chris Carpenter and Adam Wainwright were very worthy candidates as well. Carpenter was 3rd in the league in complete games after coming off multiple injuries and Wainwright led the league in wins, which is a common staple among Cy Young winners. Congrats to Timmy on another trophy for the case, I guess the answer to the popular question “Have you ever won a Cy Young on weeeeeed, maaan?” would be a definite “yes”. Check here to see how far off the Thunder Treats authors preseason MLB predictions were. You are currently browsing the archives for the Tim Lincecum category.